L = 605 SMOH Engine was torn down 50 hrs ago due to starter adapter failure and contaminating the engine. Work done was similar to an overhaul. R = 1343 SMOH 40 hours ago, this engine was top overhauled using six new Continental cylinder assemblies including overhauling the fuel controller, waste gate overhaul, and alternator overhaul. - Props: Both were overhauled in August of 2017. Currently have 40 since overhaul. 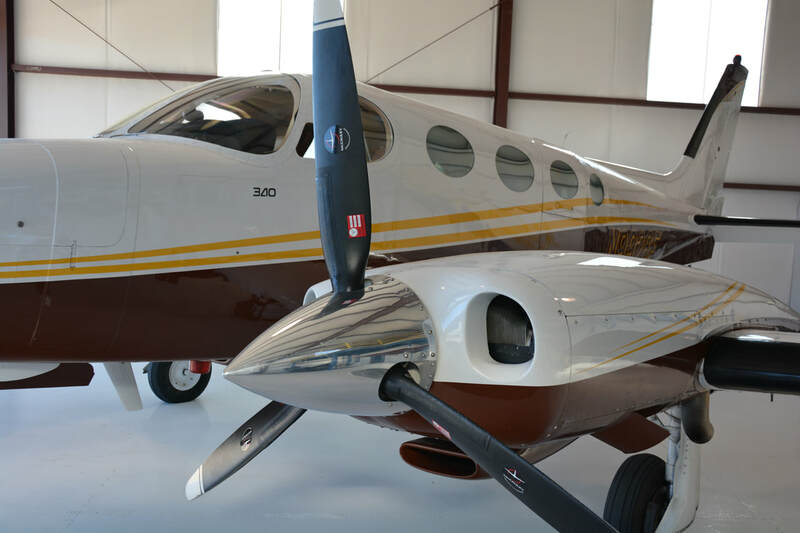 - Cessna 400A autopilot overhauled 10 hours ago: Everything associated with the autopilot was gone through and repaired or replaced. Total hours spent on this was just over 300 hrs (not a misprint). Works perfectly now. Four pages in logs of everything that was done. - Electronics Engineering engine monitor. This is the early version. - Argus 3000 moving map. - Shadin digital fuel flow. - 202 gallons of fuel. 20 gal tank in each nacelle tank. - All boots recently replaced and are literally like new. No patches with good shine. Paint was recently done in white, brown, and yellow. Very attractive and in excellent condition. Rate it a 9/10. Interior done the same time as the exterior. Seats are a heavy saddle tan leather with sheepskin inserts in the cockpit. The former owner, who passed away before I bought it, was a rancher and the leather is like the leather on a saddle. Side panels and carpet were done as well as new plastic around the windows. Very good condition. Rate it an 8+/10. ​ Glass is average with some scratches on the windshield. 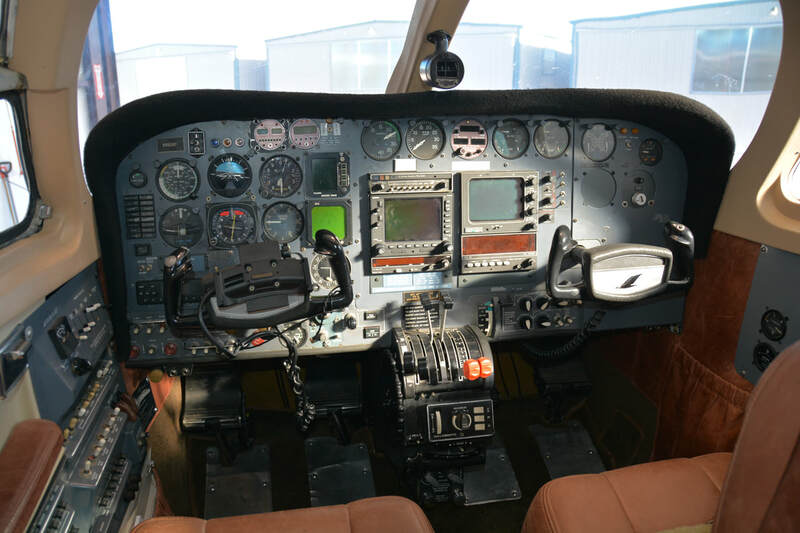 Complete Cessna (Sperry) 400A Autopilot overhauled by Autopilot Central 6/2018. Pressurization repaired by Sparks Aviation, Tulsa 6/2018. New Stratus panel mounted ADSB transponder by Autopilot Central 6/2018. Heater overhauled 8/2017. New batteries 8/2017. 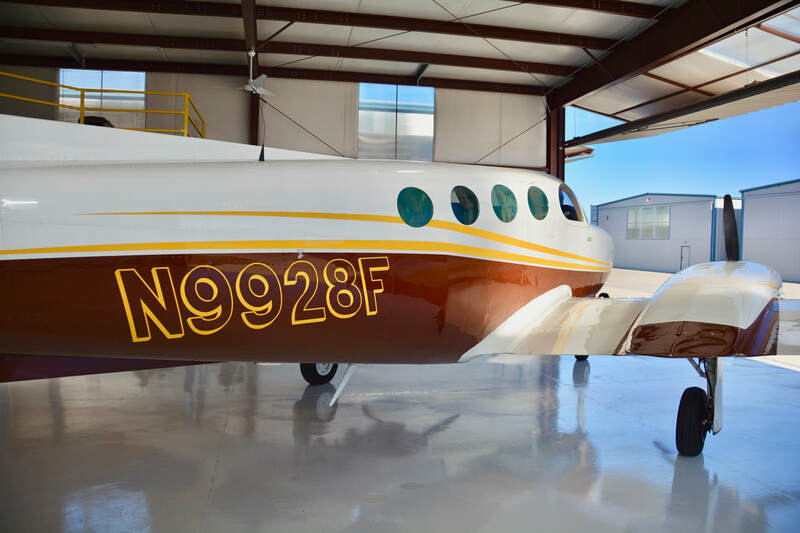 New paint and interior by Airpower, Mesa, AZ with new foam and leather. 10/2013. New boots 12/2013. New RH alternator and regulator 3/2012. New aileron & elevator pulleys 3/2012. LH &I RH aux fuel pumps overhauled 3/2012. AC condenser fan OH 3/2012. AC compressor belt replaced 3/2012. 134A Freon system serviced 3/2012. New door step hinges 3/2012. LH alternator replaced 9/2006. RH wing transfer fuel pump replaced 9/2006. LH windshield replaced 12/2004. Exhaust system sent in for overhaul. All exhaust components must be overhauled again at 6809 TT airframe aft of the slip joints. Keith AC instaled 10/1999. RH engine overhauled 9/1997. Both RH aux fuel tanks replaced 2/95. Left Engine Logbook Highlights: currently 605 SMOH. Dec. 2018 compressons were 64..70..76..64..78..76. At August 2017 annual, props overhauled, engine converted from a TSIO 520 N to the K model due to the new props. Basically changed the max RPM. 50 hrs ago, this engine was torn down due to a starter adapter coming apart inside the engine. Similar to an overhaul, but not listed as such. Case repaired @ 277 SMOH due to case crack. Turbo charger and controller overhauled 11/2003. Prop logbooks: Both props ovehauled Aug, 2017. Current time on each is 38 hrs. This is a very attractive 340 owned by a rancher in WY who passed away. His last annual was done by Arlins in Bozeman, MT. A very reputable shop that has been around since the early 70s. I actually worked for Arlin in his shop in 1975 and we have been friends every since. Excellent mechanic and wonderful person. His last annual included an extensive top overhaul on the right, higher time engine including all new cylinders, plus both prop overhauls, and a number of other things. Cost was $60,000.